Class is in session for the Amazing Spider-Man. As Marvel Comics charts new territory in Dan Slott’s modern-day Amazing Spider-Man series, they’re also visiting an iconic era in Spidey, a new in-continuity series that finds Spider-Man at the peak of his high school career. Charting the four-colored time machine through is writer Robbie Thompson (Silk) and artist Nick Bradshaw (Wolverine and the X-Men). Together, the creative team will swing headfirst into Stan Lee and Steve Ditko's famed era of Spider-Man stories, while honoring other Spider-Man heavyweights like Todd McFarlane, Dan Slott, Gerry Conway, and more. But one constant that readers can count on in this in-continuity series, however, are iconic villains, the old Parker Luck, and brand-new legends of its own. And harkening even closer to the silver age of Marvel storytelling, each issue of Spidey will carry a one-and-done format, giving new, lapsed, or veteran readers clean and accessible Spider-Man stories unburdened by continuity. Below, Thompson breaks down how Spidey came to be, what makes teenage Peter Parker unique from his modern-day counterpart, and how his series thematically ties into Marvel Studios’ upcoming Spider-Man film. And be sure to check the gallery below for exclusive interior pages from Nick Bradshaw. What is it about Spider-Man's high school years that makes them worth re-visiting in an ongoing series? What particularly are you trying to recapture from that span of time in Spidey's life? It’s Spidey! In High School! Learning to be a hero! All done by amazing artist Nick Bradshaw! ‘Nuff said! ...Well--That’s a very loose summary of what Nick Lowe said to me when he called and asked me if I wanted to pitch on the book -- and I was sold before he got to the ‘Nuff said. He had a such a strong sense of what he wanted the book to be and where we could take it, and I couldn’t wait to pitch on the book. I’m in his debt once again for putting me on the Spidey team. I think the book is actually best summed up in the tagline Marvel created for it: before he was Amazing... he was Spidey. For me, that’s been a huge appeal of working on the book -- getting to go back to the high school years and shine a light on the early days of Peter Parker’s journey to becoming Spider-Man and doing it in an old school fashion -- single issues, each one telling their own story. How do you plan to execute a canonical re-telling of the high school years? Are you going to write direct adaptations of classic Lee/Ditko stories, or just acknowledge them in a roundabout manner? We’re not seeking to re-tell any stories per se, or do direct adaptations, but rather capture the tone and feeling of the original Lee/Ditko comics. Our goal is to make a fun book, a hopeful book, that someone coming off, say a Marvel movie with Spider-Man in it, can understand very easily. I’ve got an inside track to what Dan Slott has planned in Amazing Spider-Man (and it’s incredible) but the CEO of Parker Industries globe-trotting and such is a far cry from lowly high-school student Peter Parker. I’m paraphrasing here, but I think Axel Alonso put it best at the Spider-Man and his Amazing Friends panel at SDCC -- everyone has a FIRST Spider-Man comic book. And there are a lot of people who know Spider-Man from the movies, or the animated show or video games -- but not all of those folks have tapped into the source code of the character: the comics. Our hope is Spidey can be a gateway to new readers, inspiring them to dig through the endless Spider-Man comic lore -- whether it’s the classic stories of Lee and Ditko, or the epic world hopping stories to come in the pages of Dan Slott's Amazing Spider-Man. And we also hope to bring in lifelong fans with a trip down memory lane, harkening back to the types of stories those of us who grew up reading Spider-Man remember. Where in Spider-Man's high school career will the series begin? Right after Uncle Ben's death? Around the events of the Master Planner? Why is this point in Spider-Man's timeline the right entry point for you story? Peter is a fifteen-year-old kid, he’s been active as Spider-Man for a little while, but he’s still a rookie, still gaining experience and making a name for himself. Most people know the origin story of Spider-Man, so rather than re-telling that story, we’re going to start each issue with a recap page that sums up his origin visually - and then launch right into the monthly adventure. It’s all in the mold of traditional, old school Marvel books -- no matter what number is on the cover: each issue may be the reader’s first issue. This is the best entry point for our stories because Spider-Man is still new to all of this. He’s still getting his bearings and isn’t tied to any longer stories or history just yet -- he got bit by a radioactive spider, he tragically lost uncle and now he’s vowed to learn what it means to have great power and great responsibility. 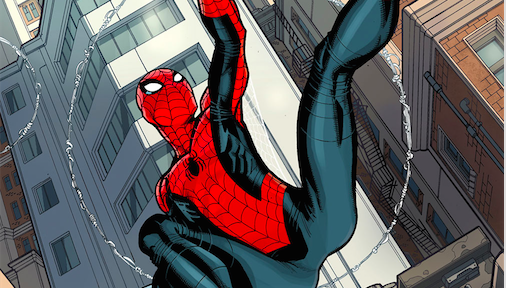 Marvel already has a modern re-telling of Spider-Man's high school career with Brian Bendis' initial Ultimate Spider-Man run, so how do you plan to make Spidey different from that? What new wrinkles to the "teenaged Spider-Man" mythos do you plan to add? We’re looking at this book as less a “re-telling” and more of a look at Peter’s younger years. For my money, Spider-Man is one of the best and most enduring characters because he always does the right thing yet doesn’t always get the bad guy. That “Parker Luck” is always there, whether he has the mask on or not. But what’s great and inspiring about the character is that he never lets it get him down. He always gets back up and takes another swing. And he does it with a sense of fun and whimsy. So, our stories are going to explore where that never-say-die attitude came from, and the people, friends and enemies that helped shape that part of his character. How will you keep established Spider-Man readers engaged and on its toes, when they essentially know the gist of Spider-Man's high school story? We definitely want to be new reader friendly, but we also want to reward lifelong fans of Peter Parker and Spider-Man as well. Part of that will come from seeing these early tales of Spidey, and part of it will come from the fun of seeing Peter be a kid again. As Nick Lowe pointed out early on in the book's production -- Spider-Man was only in high school for 30 issues back in the Lee/Ditko days. And yet, we all think it was forever. This is a chance to go back to that vibe and energy and see Peter struggle to fit in at school, while trying to make a name for himself as a hero. And, he has to do all that while trying to help out his beloved Aunt May. There are complex and personal stories still left to be found in those years, and I’m thrilled to be a part of the team bringing them to the page. What fundamentally separates adult Peter Parker from teenaged Peter Parker? How are their views on "Power and Responsibility" different from one another? I think the biggest difference is experience and the confidence that comes with that. Peter Parker of today has been through so many epic adventures, had so many victories, and so many personal loses. Whereas younger Peter is just beginning. Power and Responsibility are things that Peter is just learning how to balance in high school. It’s going to be a bumpy ride, but one that he’ll always find a way to get through. Besides Spider-Man, what other classic characters are you excited to explore ? Well, right out of the gate we have one of my favorites, Doc Ock. He’s a lot of fun to write and I love his dynamic with Spider-Man. We’re going to be having some fun encounters with a lot of classic Spider-Man villains from the start and eventually even see a Sinister team up. But I’m also really excited to explore Peter’s high school life. I think one of the things I’ve always loved about Peter is that he’s an outsider. I can relate to that. And yet, he finds ways to fit in -- as himself. That was a really important thing for me to see as a kid: that it was okay to be yourself, to be an outsider, and yet fit in because of that. That being an outsider or different could be a strength. And I hope that kids that pick up this book see that as well. Be different. Be weird. Be yourself. The title "Spidey" suggests a lighter tone and feel for this book. Is that the direction you going for? Are you planning to give Spidey that light-hearted, optimistic tone that defined Stan Lee's run? Absolutely. Our target is that anyone can pick up the book. The next Spider-Man movie is also set during Peter Parker's high school years. Are you looking to that film's progression and production for any inspiration? Or, conversely, are you hoping to see some of your plot threads show up on the big screen? As a fan, I’m very excited to see the new MCU Peter Parker and Spider-Man. I can’t wait to see him up on the big screen again. But since that’s a little ways out, we’re going to try to carve out our own little corner of the younger Spider-Man years. We’re all playing in the same sandbox and as I mentioned before, there are a lot of stories left to be explored in the younger years. Excellent. So before we wrap up, is there anything else you wanted to mention? Nick Bradshaw's work on the book has just blown me away. I’ve been a fan of his for a long time. He has a fantastic story and character sense and his work just leaps off the page. Having a front row seat to watch him work through designs, layouts, pencils and so on has been an absolute thrill. He’s brilliant and has been killing it on this book -- I can’t wait for people to see his pages! Are you excited for Spidey? Let us know in the comments!